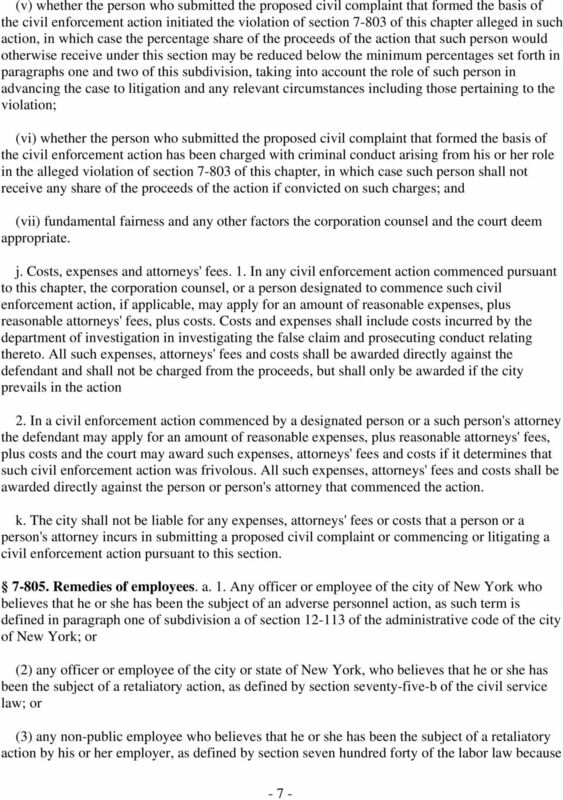 Download "NEW YORK CITY FALSE CLAIMS ACT Administrative Code 7-801 through 7-810 *"
1 NEW YORK CITY FALSE CLAIMS ACT Administrative Code through * Short title. 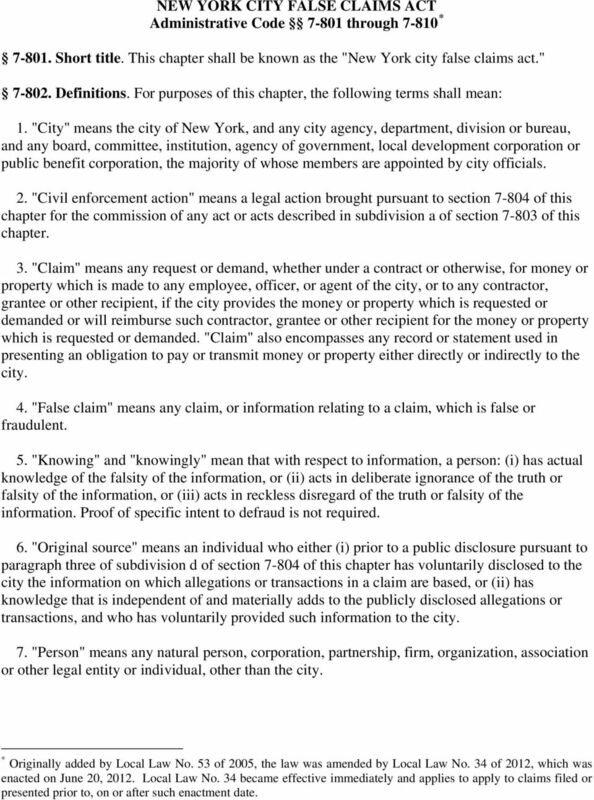 This chapter shall be known as the "New York city false claims act." Definitions. For purposes of this chapter, the following terms shall mean: 1. "City" means the city of New York, and any city agency, department, division or bureau, and any board, committee, institution, agency of government, local development corporation or public benefit corporation, the majority of whose members are appointed by city officials. 2. 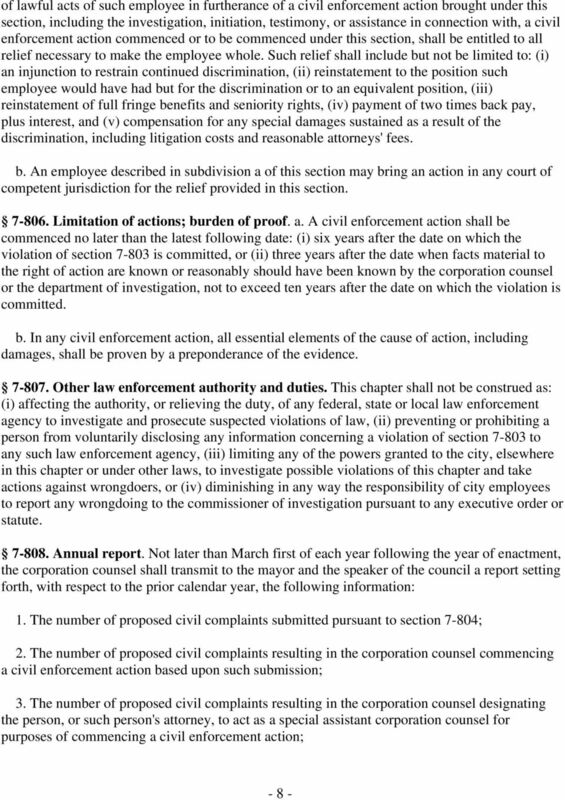 "Civil enforcement action" means a legal action brought pursuant to section of this chapter for the commission of any act or acts described in subdivision a of section of this chapter. 3. 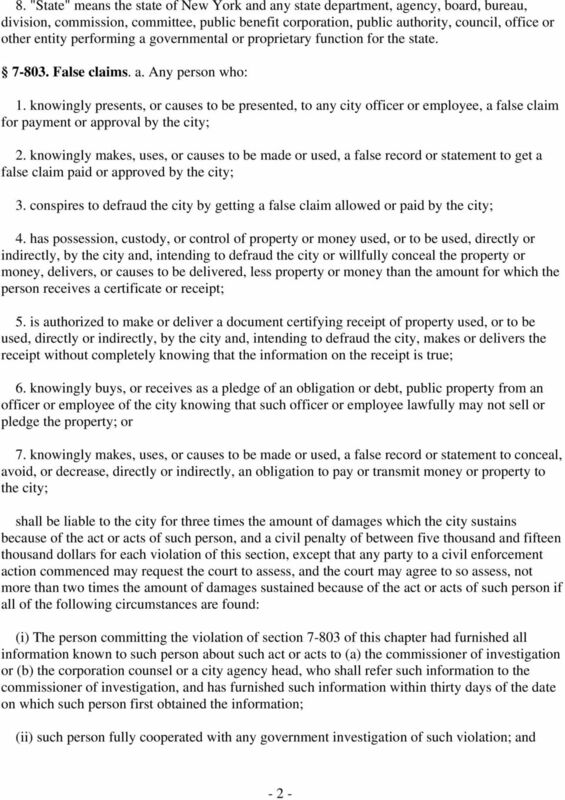 "Claim" means any request or demand, whether under a contract or otherwise, for money or property which is made to any employee, officer, or agent of the city, or to any contractor, grantee or other recipient, if the city provides the money or property which is requested or demanded or will reimburse such contractor, grantee or other recipient for the money or property which is requested or demanded. "Claim" also encompasses any record or statement used in presenting an obligation to pay or transmit money or property either directly or indirectly to the city. 4. "False claim" means any claim, or information relating to a claim, which is false or fraudulent. 5. "Knowing" and "knowingly" mean that with respect to information, a person: (i) has actual knowledge of the falsity of the information, or (ii) acts in deliberate ignorance of the truth or falsity of the information, or (iii) acts in reckless disregard of the truth or falsity of the information. Proof of specific intent to defraud is not required. 6. 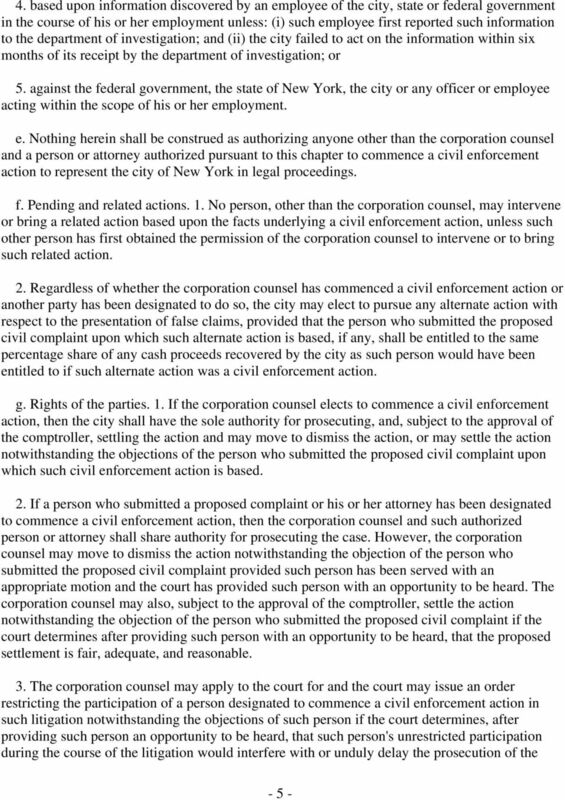 "Original source" means an individual who either (i) prior to a public disclosure pursuant to paragraph three of subdivision d of section of this chapter has voluntarily disclosed to the city the information on which allegations or transactions in a claim are based, or (ii) has knowledge that is independent of and materially adds to the publicly disclosed allegations or transactions, and who has voluntarily provided such information to the city. 7. "Person" means any natural person, corporation, partnership, firm, organization, association or other legal entity or individual, other than the city. * Originally added by Local Law No. 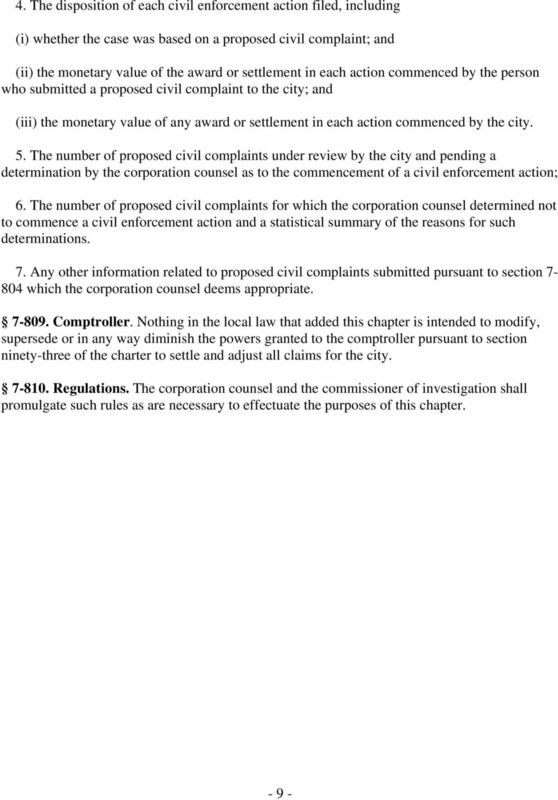 53 of 2005, the law was amended by Local Law No. 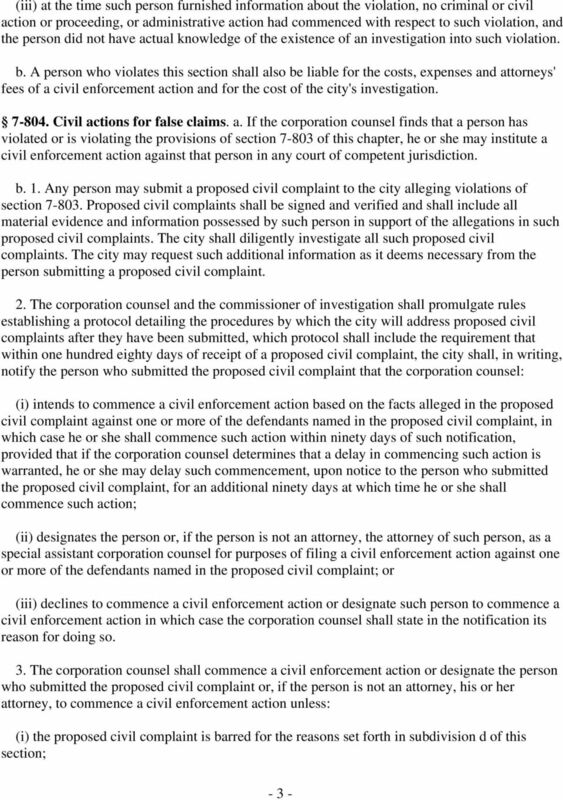 34 of 2012, which was enacted on June 20, Local Law No. 34 became effective immediately and applies to apply to claims filed or presented prior to, on or after such enactment date. Minnesota False Claims Act Minnesota Stat. 15C.01 to 15C.16) 15C.01 DEFINITIONS Subdivision 1. Scope. --For purposes of this chapter, the terms in this section have the meanings given them. Subd. 2. Claim. MINNESOTA FALSE CLAIMS ACT. Subdivision 1. Scope. --For purposes of this chapter, the terms in this section have the meanings given them. Minnesota False Claims Act (Minn. Stat. 15C.01 to.16) i 15C.01 DEFINITIONS Subdivision 1. Scope. --For purposes of this chapter, the terms in this section have the meanings given them. Subd. 2. Claim. Broward County False Claims Ordinance. (a) This article shall be known and may be cited as the Broward County False Claims Ordinance. (a) The title of this section and 71-5-182-71-5-185 is and may be cited as the Tennessee Medicaid False Claims Act. 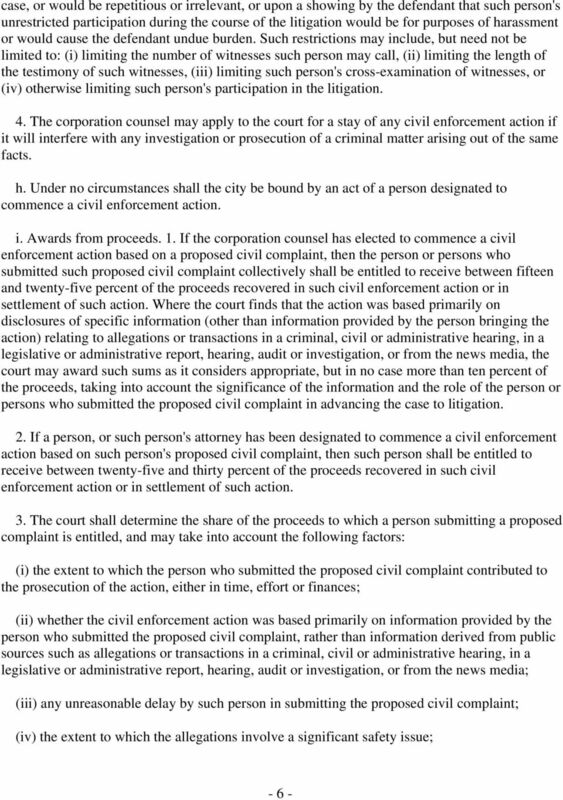 Appendix L: Nebraska s False Medicaid Claims Act Nebraska Statues Chapter 68 November 2013 Section 68-935 Terms, defined. 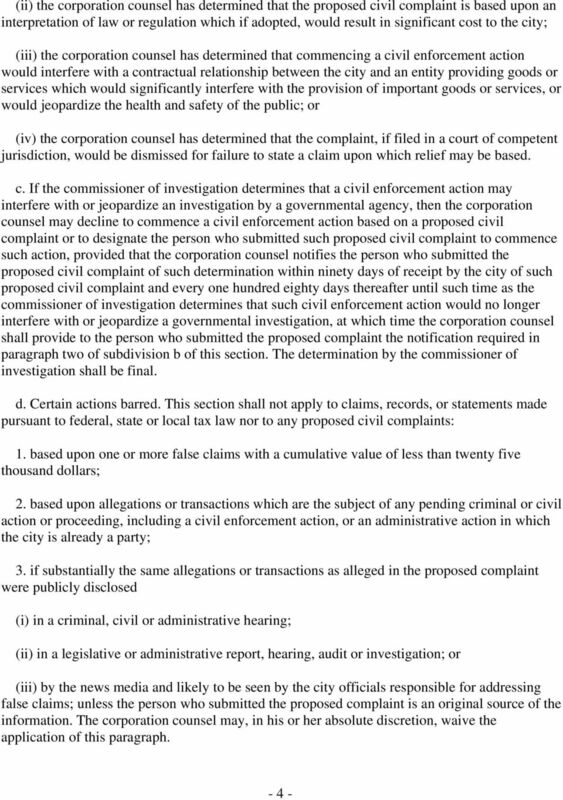 Illinois False Claims Act (740 Ill. Comp. Stat. Ann. 175/1 to 175/8) i 740 ILCS 175/1. [Short title] Sec. 1. This Act may be cited as the Illinois False Claims Act. 740 ILCS 175/2. Definitions Sec. 2. OSF HEALTHCARE FALSE CLAIMS PREVENTION AND WHISTLEBLOWER PROTECTIONS POLICY: CC-109 It is the policy of OSF HealthCare (OSF) that false, inaccurate or improper claims will not be submitted to any payer. MEMORANDUM. 2. Public Health Solutions responds to questions and reports of fraud, waste, and abuse quickly. This policy applies to UNTHSC employees, volunteers, contractors and agents. Summary: The Organization directs its activities in full compliance with Federal, State and Local laws and regulations. Office of Personnel Management. Policy Policy Number: Definitions. Communicate: To give a verbal or written report to an appropriate authority. B. Prevent, detect, and respond to unacceptable legal risk and its financial implications. C. Route non-compliance issues to appropriate areas. North Shore LIJ Health System, Inc.